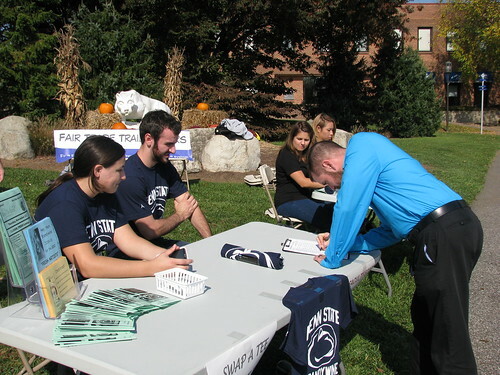 We just finished our second Alta Gracia t-shirt swap on campus, swapping gently used t-shirts for brand-new special-ordered Penn State Brandywine Alta Gracia shirts! All collected and donated shirts are being donated to Planet Aid, a nonprofit organization that collects and recycles used clothing to protect the environment and support global sustainable development. We are still swapping out some last-minute t-shirts, but we have given out at least 70 Alta Gracia shirts and collected over 120 to donate to Planet Aid! For those of you that follow our website, you may recall reading about our first t-shirt swap and our recommendations for how to host a t-shirt swap. Instead of repeating that same information, we are going to add a few updates in this blog post. As with our Go Bananas for Fair Trade event this semester, the students of BA 100 (Introduction to Business) helped out again in running the event. We have to thank Professor Olear and her students once again for their enthusiasm and assistance! We provided a three-fold brochure with every shirt describing Alta Gracia, Planet Aid, and included our mission and vision statements for the Fair Trade TrailBlazers. It never hurts to put the information directly into people’s hands! Tweet like crazy during your event! We were thrilled to have @wearaltagracia and @planetaid both follow us and retweet our images and tweets during the event, as well as other groups. This made us feel that we were really getting the word out and making an impact beyond our campus event. We were disappointed that, although we sent out campus-wide emails and posted flyers, that the announcement didn’t appear on our campus website or campus Facebook page. We have to remember to directly ask for the assistance with this publicity from our University Relations Office to get the maximum reach across the campus population. And a friendly warning message… don’t assume that where you get your funding from for the t-shirts the first time will fund you a second time! 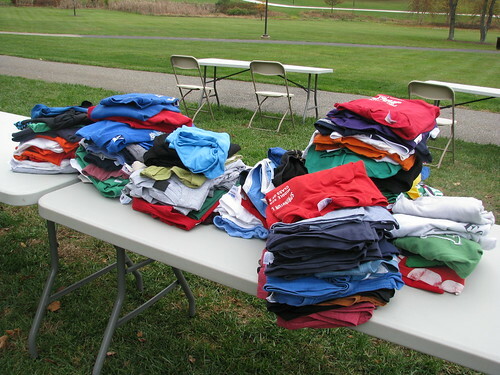 For our first t-shirt swap back in Spring 2012, our campus Student Acitivty Fee (SAF) committee funded us and even encouraged us to apply for more funding to get more shirts for a second event. Fast forward to Fall 2012, a different SAF committee composition of students and faculty – we applied for more funding for more shirts, and we were completely denied funding – unless we became an official student club, which is not what the TrailBlazers are about (see Sarah’s post describing our campus identity). Soooo… we had already special ordered the shirts through the campus bookstore, and the shirts were on the way, so we needed to find some funds, and fast. We really need to thank the Laboratory for Civic Engagement for funding the student shirts, and our campus Chancellor Sophia Wisniewska for purchasing 50 shirts specifically for faculty and staff to swap. If you would like to see more photos from our event, please visit our Flickr site. Below, some of the shirts on their way to Planet Aid!